Adjustable Grinding Levels: Select from precise grinding levels for fine to coarse granules. Instead of crushing the salt and pepper, the Professional Gourmet Precision Mechanism strips them down by their individual layers as it grinds, releasing maximum flavor. Maintains Freshness: Your favorite spices will stay fresh, protected from moisture and dust, with one of these best-in-class salt and pepper grinders. For greatest freshness, store in a cabinet out of the sunlight when you are not using them. 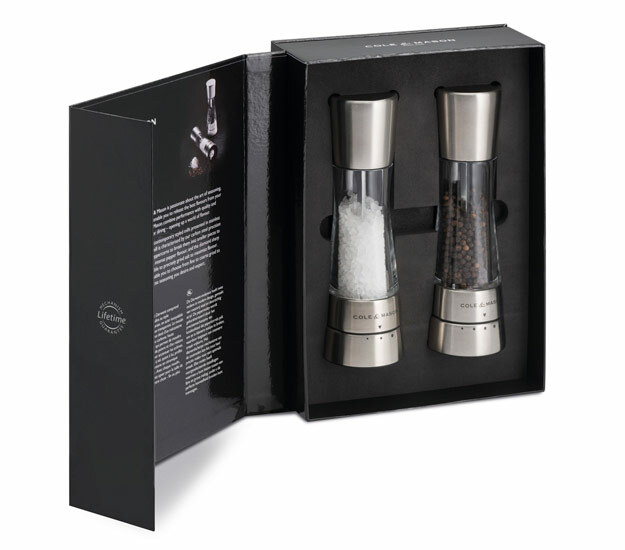 The Cole & Mason 7.5-inch Gourmet Salt and Pepper Mill Set, with its stainless steel housing and acrylic hourglass display, provides a sleek, modern addition to any table. 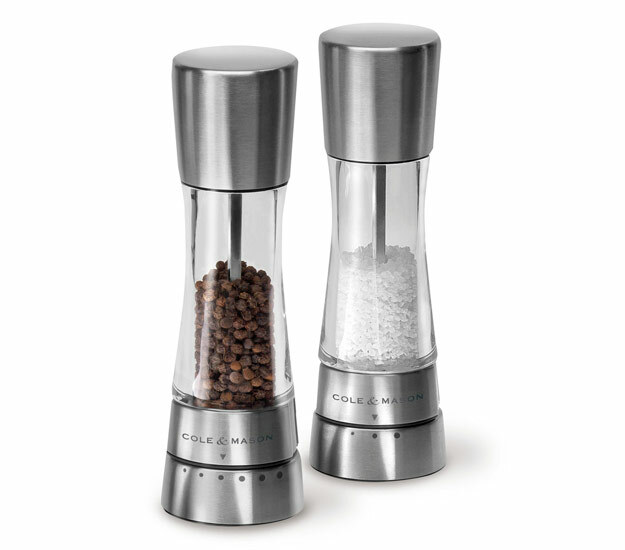 The pepper mills use premium hardened carbon steel millworks for easy-to-use spice control. Choose from six distinct settings, from fine powders to coarsely ground or gourmet chunks. The salt mills use premium diamond-cut ceramic millworks offer three distinct settings, from fine grains to coarsely ground gourmet chunks with even hard large-grained artisan sea salts. The stainless steel grinder gift set comes ready to give in a beautifully constructed box that is perfect for any occasion—birthdays, weddings… Valentine’s Day, Mother’s Day! Style, durability, and dependability have been built into every Cole & Mason product since 1919, and have been well-regarded by professional cooks and homemakers ever since. The Cole & Mason 7.5-inch Gunmetal Derwent Pepper Mill boldly conveys modern style on your table with a sleek acrylic hourglass display. 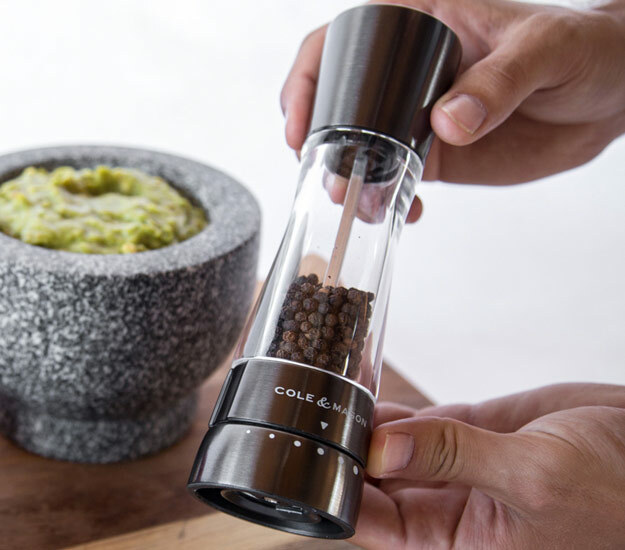 The pepper mill uses premium hardened carbon steel millworks to bring user-friendly control for grinding level with six distinct settings—from fine powders to coarsely ground and gourmet chunks. Note: The gun metal individual grinder does not ship in a gift box. 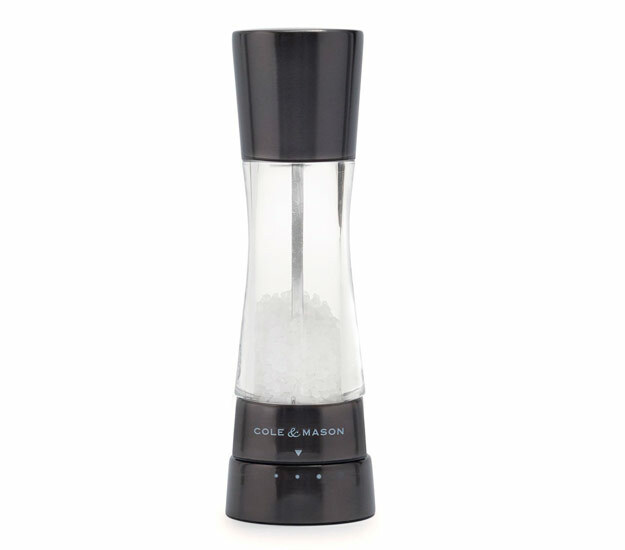 The Cole & Mason 7.5-inch Gunmetal Salt Mill boldly conveys modern style with its sleek acrylic hourglass display. The salt mills use premium diamond-cut ceramic millworks to offer three distinct settings, from fine grains to coarsely ground gourmet chunks, and can accommodate even large-grained artisan sea salts.